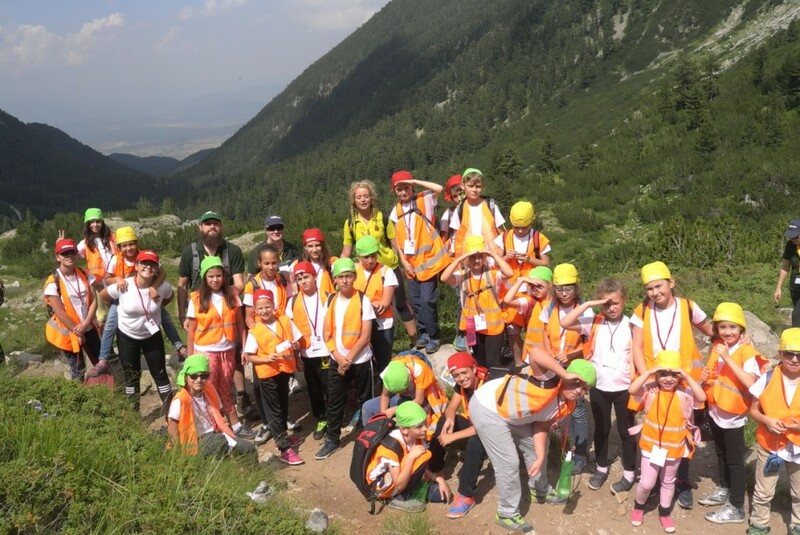 Lucky Kids > Blog > Why is it helpful for children to visit a language camp? Every parent has this problem: during school holidays, children have plenty of free time and parents work and cannot control them. Dangers are lurking everywhere – both outdoors and at home, because of virtual space. Is it possible to have a solution in which the child is safe and at the same time learns a foreign language with pleasure? The answer is positive and is called Children’s summer language camp! What are language camps for children? In short, during the camp, children learn a foreign language while having fun. For example, LuckyKids organizes such an educational English language camp. Classes and games take place in the language studied and in this way the kids communicate with the teachers and animators. It may sound complicated for a kid who has no language learning experience, but it is not. Practice has shown that even children who have not studied English quickly overcome the barrier due to informal communication and experienced teachers. 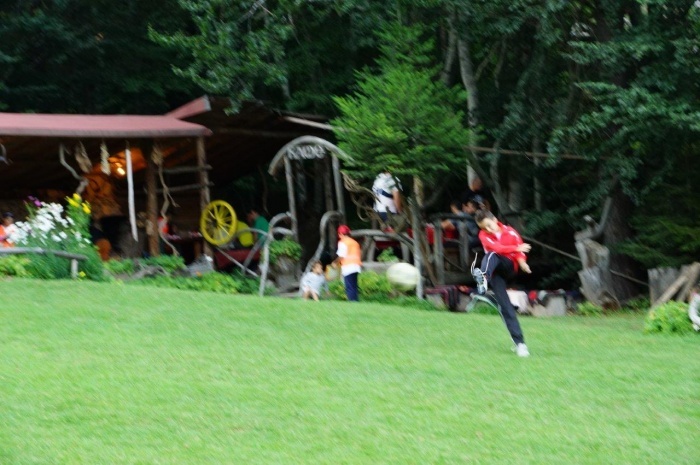 The camp is for children from 5 to 14 years of age. Teachers come from English-speaking countries and animators are Bulgarians with perfect English. Team members have experience with educational programs and systems in countries around the world – Great Britain, United States, United Arab Emirates. This allows them to compile a comprehensive program for the children’s language camp that is consistent with the world’s leading practices. It is important to note that at the English LuckyKids camp to avoid acquiring the knowledge the boring way – by heart. The children themselves get to it in a different and much more pleasant way – they perform tasks on various projects, present specific topics, discuss given cases… In this way, their creative potential is activated and they become active participants in the training under the guidance of the experienced tutors. So their children are much more interesting and that means they learn more quickly and efficiently and the knowledge is kept permanently. Parents will be able to convince themselves of the progress in English with tests at the beginning and end of the summer camp for children, and will get a detailed analysis. How are the security and safety of children ensured in a language camp? First and foremost a language camp for children must certainly be safe and secure. LuckyKids camps have thought about this, even when it comes to the hotel itself. The 5-star Aparthotel Lucky Bansko SPA & Relax is used as a base; it is tailored to the smallest details for the presence of many children. For example, the floors are carpeted and there are no potentially dangerous items such as fragile glass and sharp edges. The teenagers are divided into groups of ten, and for every five there is a teacher or an animator to care of them. In this way, they are not alone, without adults nearby, and there is a permanent control. Teachers and animators can see to the safety at night as they are placed on the same floor with the children. All measures for the safety of children during the English language camp have been taken also during the various types of fun activities. 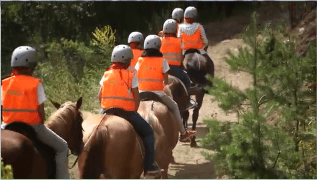 One example, in horseback riding, kids use mandatory helmets and other protective gear and each horse is guided by an individual leader. In the swimming pool, where swimming classes take place, the children are watched all the time by a lifeguard and also by some of the teachers and animators. Safety measures are as strong as possible also during paintball, mountain biking and all other fun activities. Qualified medical staff is always with the groups in the mountain and has the necessary equipment. So you can rest assured that there is constant control over the safety and security of your child during the language camp. Instead of constantly thinking whether everything is alright while you are at work, you can provide your child with an exciting and interesting vacation through which it will greatly improve his or her English knowledge. It sounds good, doesn’t it? What are the benefits of additional English language learning? For starters, we can congratulate you for choosing your child to learn namely English! In today’s world, it is English that unites the planet. It is the official language in more than 50 countries, one of the six official languages of the United Nations Organization and it is also recognized as one of the languages of the European Union and NATO. Surely the English language will help your child communicate freely with people around the world, and why not more than that – help him or her to a serious career progress in personal life? Too often, however, classroom learning is not enough to master the language, especially because of the lack of truly qualified teachers and the outdated teaching methodology. Then the question pops up – whether the child should enroll in a language school or a language camp? Schools are not a bad option but there is a serious problem with them – children do not perceive them well, especially when they are on vacation. The reason is clear – the little ones have to go to school almost every day, and when they decide that they will rest in the summer and have fun, they are enrolled in a language school. This certainly is not to the liking of the children who perceive language school attendance just like attending school – as annoying and obligatory. You can easily guess that if they do something that is mandatory, they will definitely not obtain the desired results. And visiting a summer language camp is something completely different. Children definitely perceive English language camps not as a school but as a place where they can have lots of fun. They have changed the setting, parents are not in their hair and they enjoy learning much more. Parents, for their part, are pleased with the language camps for children because the children combine their active rest with lessons in English language. How can children easily learn language in an informal setting? As we have already learned, children absorb the knowledge best when the lessons are interesting and fascinating. Communicating in an informal setting is also crucial for an easier learning of the language. At the LuckyKids Summer English Camp close attention is paid to this component, and it is one of the reasons children can manage to significantly improve all forms of language proficiency. Whatever they learn by noon is practiced in entertaining activities organized in the afternoon. 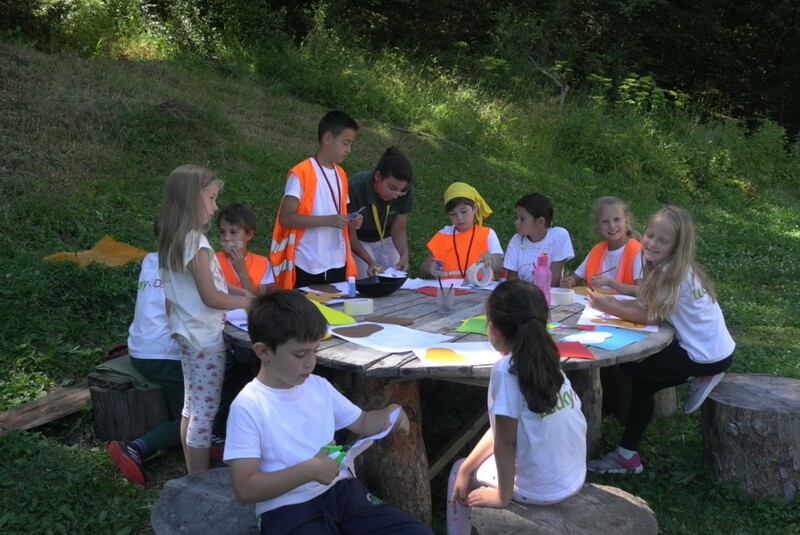 They are many and extremely varied as fun and games are essential in the concept of the language camp. Film nights, theater plays, treasure hunting, discos are organized in the 5-star Lucky Bansko Hotel, where everyone are accommodated. There are excursions, mountain walks and many other activities like horseback riding which we have already mentioned. In winter, summer activities are replaced by ski lessons, with training by qualified instructors. During all these exciting experiences, communication is in English. Conversations in foreign language with teachers, animators and other children not only during the class but also during the fun activities help a lot for easier and quicker learning of the language. Both teachers and animators at the Summer Children’s Camp have many years of experience in communicating and working with children. As LuckyKids’ accent is the acquiring of knowledge through entertainment, leisure time does not pass unutilized and then serious attention is paid to children’s learning of all the components of English language. Why is the language camp a great alternative for a summer vacation? Let’s imagine the following – during your summer vacation, your child has fun, lives actively, eats healthy food, makes new friends from Bulgaria and abroad, his or her security and safety are under control and together with all this he or she learns English with desire. It sounds great, doesn’t it? Even a bit incredible but it will actually be quite real if the child enrolls in the LuckyKids English language camp. The campus program was developed by a team of lecturers on the principle of project-based learning. This is an innovative modern method that has become part of all international schools in the last decade. As children develop projects on different topics besides language skills, they also build on many other areas of the natural and social world. Interactive learning is included in the summer language camp program with all groups (excluding the beginners’) by using computers and an interactive board. For the beginners’ group different working methods are provided which are determined by the dynamics of the group. With all groups, serious attention is paid to the audio-visual perceptions of the children. Some of these modern methods for learning foreign languages and teaching in the initial stage of education are Solar Pedagogy, Suggestopedia, Montessori and others. Also in the language camp, children learn different virtues and are encouraged to apply them every day. A serious requirement for teachers is to ensure that learning is fun for the learners and to provoke them to seek new knowledge themselves, not just about English language. A very important part of the regime of the children in the camp is healthy and balanced nutrition. And we have already mentioned all the exciting and attractive activities that await the children outside the classroom. Summing it up in one sentence – a summer language camp in English is the key to your child’s happy and fruitful vacation combined with your peace and satisfaction. Take advantage of it!